Outstanding build quality with an uncannily transparent and revealing sound that is also high on musicality. With both CD and SACD, it is an exceptionally capable player. Perhaps not for those who like their music euphonically enhanced. No digital inputs, remote is a little on the big side... er, that's it. The Esoteric X-03SE is a gorgeous CD player in all respects. It looks great, it is built to a standard that Rolls Royce would be proud of and it sounds superb. All things you might hope for of a CD player that costs nearly five grand, and all things you would expect in a range-topping machine. 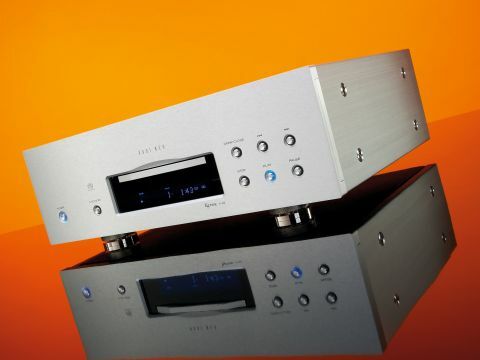 But this is no range topper; in fact, it's Esoteric's new 'UK entry-level' CD/SACD one-box player in what must be the most extensive range of high-end audio disc players on the planet. Esoteric is the resolutely audiophile arm of the already partly audiophile TEAC of Japan, acknowledged creator of the most heavily engineered disc transports in the business - the VRDS mechanism. We recently looked at the X-01 Limited (alongside the G-0s Master Clock Generator), a £9,500 player of spectacular ability. The X-03SE is the next player down the range and it too can be partnered with a G-0s, but as it stands is an CD/SACD player of considerable capability. Engineering quality has always been the cornerstone of the Esoteric brand and this 23.6kg player takes this ethos very seriously. At its heart is the massive VRDS-NEO transport - a high-precision turntable and Hall-effect, three-phase motor built into what Esoteric calls a "rigid bridge chassis". The term 'turntable' might seem odd for a CD player, but the platter clamps down on the disc from above, providing damping and a black non-reflective surface to cut out stray reflections. This is far removed from standard issue CD transport mechanisms. The main difference between the X-01 Limited and this player is that the dearer machine has multichannel analogue outputs and the X-03SE has stereo only. Both machines have an IEEE 1394/i.Link digital output, however, and thus can play multichannel tracks with an appropriate processor. Internally, the mechanical differences are that the bridge is a bit lighter (which in Esoteric speak means substantial rather than capable of supporting a Chieftain tank) in the X-03SE and the platter is duralumin (an alloy of aluminium, copper, magnesium, and manganese) rather than pure magnesium. Component wise, the more costly machine has four DACs per channel rather than the two found here. So, in fact there are more similarities than variations - both models, for instance, use high-purity 6Ns copper for both power and signal connections, have upgraded components over the base versions and are built with solid aluminium top and side panels rather than folded steel. The engraving of the Esoteric brand in the top plate is particularly attractive; reason enough, perhaps, to pay the small premium for 'SE' status, even if the base model were available in the UK - which it isn't. The final Special Edition twist is the use of WBT NextGen RCA phono sockets. These connectors are pretty rare and differ from the norm in having relatively little metal in their construction in order to reduce eddy currents. They work with both regular and NextGen plugs but should give best results with the latter. The second analogue connection option is balanced XLRs, for which the paired DACs produce a differential output. The converters in this case are 24-bit Burr-Brown PCM1704 devices; you have the option of bypassing these by using the optical or electrical digital outputs, of which the latter variant also has a NextGen socket, but the chances of finding an outboard DAC to better the onboard option are pretty slim. There is one extra socket on the player - a BNC, for an external word clock such as Esoteric's G-0s. This provides a master clock that will run the player so precisely that it virtually eliminates jitter. But, as the G-0s costs more than the player itself, it would only make sense where multiple Esoteric sources are used. If you place this hefty player on a surface, you notice that its three feet are not solid but a two-part construction with a point and retained cup design that Esoteric calls 'Pin-Point'. These are made in tool steel, to keep almost all resonances at bay. As we had managed to persuade Living Voice to terminate a pair of its interconnects with WBT NextGen plugs a while back, it made sense to use these with the X-03SE, at least when we weren't taking advantage of the theoretically superior balanced outputs. Like the last £5k CD player that found its way into our test system (Classé's CDP-202), the Esoteric took its time to come on song; its sound was a little on the clinical side for at least the first week. This was a characteristic that started to sound more like precision, once the player had been run-in. In terms of presentation, it provides an interesting contrast with the Classé - both are high-resolution machines but, if the CDP-202 is warm and smooth, the X-03SE is clean and tight. The Esoteric player initially provided a more precise sound with greater vivacity but not perhaps as much subtlety, but by the time it started to sing the Classé had left the building. This means that unfortunately we couldn't compare the two at their best directly, but could get down to the important business of playing as many discs as time and heatwave (remember that?) would allow. This proved a highly entertaining procedure as you might imagine, Alfred Brendel's fingers sounding more eloquent and expressive on the keyboard than is usually the case, thanks to a tremendous transparency that reveals fundamental and harmonics in truly three-dimensional form. For all their fantastic build, big TEACs of yore have not always been able to combine transparency with musicality, a rare trick at any price point with digital sources, but one that it has managed to pull off with this beauty. The way that the music flows, its changes in level and attack, are all preserved in a soundstage that can seem holographic with a good recording. One such - Fink's Biscuits for Breakfast - really surprised us with the way that the reverb took sounds way back behind the B&W 802D loudspeakers. A more natural recording, Keith Jarrett's Survivor's Suite, demonstrated how the stage expanded width ways and delivered very real sounding acoustic instruments, completely eliminating any cues about the placement of the speakers. You wouldn't think that such substantial speakers could disappear, but close your eyes, turn around twice and you'll struggle to locate them. You'll also look daft. These qualities are even more apparent with SACD, where the extra detail delivers even greater finesse and a colouring of instrument tone. This gives recordings real vibrancy and realism. There's energy to the sound, which drives rhythmically strong material along in a dynamic and timely fashion. For example, the Lingua Franca disc produced a result that made you wonder what more can be done with the player. Compared to Townshend's £3,000 TA 565 CD, one of our reference machines, the X-03SE has greater apparent high-frequency reach and a shade more transparency, the less costly player sounding almost smoothed off and warmer in balance by comparison. Back with CD, the energy and vivacity of recordings is still not lost. Led Zeppelin ably demonstrated this, as the band (and audience) provided the energy back in 1972 on How the West was Won. On this recording, the guitar strings zinged and the auditorium expanded to allow the band's power and rocktastic majesty blow you away. With a sound like this, it's not hard to hear why this album got its title.